Edward Estlin Cummings, aka E.E. 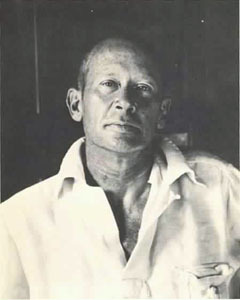 Cummings, was born in Cambridge, Massachusetts in 1894. While at Harvard, he published his first work in 1917 in the anthology Eight Harvard Poets. He volunteered for a French ambulance service during World War I and was interned at a prison camp on suspicion of espionage. Cummings returned to Paris to study art and pursue a writing career. While there, he published his first book of poetry, Tulips and Chimneys, with the help of the novelist John Dos Passos. For most of the 1920s, he divided his time between Paris and New York City, eventually returning to the United States for good. Cummings became well-known for his innovative use of slang and experimentation with form, syntax, and spelling. He won many awards, including an Academy of American Poets Fellowship, two Guggenheim Fellowships, the Charles Eliot Norton Professorship at Harvard, the Bollingen Prize in Poetry, and a Ford Foundation grant. He died in 1962 having completely altered the face of American poetry.